If you were to ask me for one word to describe the Baby Cargo 200 Series Stroller, I would answer "modern". When I took it out of the box I was surprised at how sleek and compact it was. I just popped on the wheels and the canopy (with Kenzie's help of course). We received the Smoke/Mirrors color combination and the textured fabric just screams luxe. After a moment of admiration we were ready to roll. It is technically classified as an umbrella stroller weighing in at 13.7 pounds. The matte black aluminum frame enhances the coolness factor of this stroller. One of my favorite design details is the back pocket with brass detailing. There is plenty of room to stash essentials that need to be quickly accessed. The amazing fabric is easy to wipe down which is a plus especially if you have kids that like to snack while riding or you are a rough handler and toss the stroller around. The handles are pretty high so easy for Hubs to push around. I like that we are able to use this stroller for both Mason and Kenzie since the guideline advises from birth and up. The weight capacity is 50 lbs so you can definitely get plenty of use into preschool years. There is a multi-position adjustable backrest and adjustable leg rest. The back does not recline flat but one can definitely use an infant insert or support if you are concerned. Mason is at ease with it being a bit upright - I think he likes to look around rather than being confined flat on his back. We have the support for him and it just velcros right on. The leg rest is kept straight for Mason and we lower it for Kenzie. The 5-point harness / straps are easily adjustable. Both Mason and Kenzie use the lowest slot but the harness is of course tightened a bit with Mason. The continuous Baby Cargo logo on the straps is actually great branding and does not scream out at you. I wish there was a bit of padding for the shoulder area but that is a feature on the 300 series. The push button closure is not easily opened by little Kenzie's hands (she loves closing the straps Mason's carseat, swing, bouncer, etc. with her Mickey toys settled in) so that is a big relief. 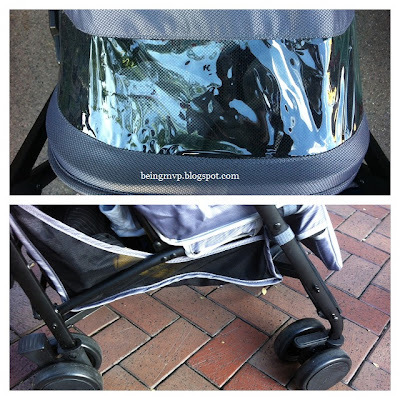 The seat is lightly cushioned which is a major plus since most typical umbrella strollers have flimsy fabric. From quick trips to the market to days at the amusement park, little bottoms and backs will be well supported and comfortable. This stroller has a basket! Most umbrella strollers are simple and do not have this feature. It's not huge but you will be able to stash items up to 5 lbs. That equates to a blanket, snacks/drinks, diapers/wipes and other small necessities. It is a bit difficult to reach into when the seat is fully reclined but as I stated above, there is a wonderful little pocket on the back that you can store quick access items. The sunshade is water-resistant which is great but a bit small. Being a bit sun-phobic when it comes to my kiddos, I would have appreciated a larger shade however it does have a see through window that is perfect for checking on your tot. It does come with a rain cover so that is definitely a plus. Aside from all the fantastic features mentioned above, the ride is top notch. From the first push I could tell that it was easy to maneuver and the wheels rolled with ease. There are brakes on both front and back wheels which you can adjust according to what surface you are strolling on. I lock the front wheels when pushing on rough terrain such as grass at the park and gravel in parking lots. This makes a noticeable difference. Both Kenzie and Mason both enjoy riding in this stroller and I like that it is super easy to whip out of the car and open/close with such ease. The fold is extremely compact and will most likely fit the smallest of trunks. This would be the perfect stroller to have multiples of especially if grandparents help with the kids. I wonder if Baby Cargo will come out with a double soon? I hope so! Buy It: You can purchase the Baby Cargo 200 Series Stroller for $149.99. It comes in three beautiful colors: Ocean/Stone, Cherry/Pom and Smoke/Mirros. Make sure to connect with Baby Cargo on Facebook and Twitter! This looks like a very sleek and functional stroller! The colors are really great too! Love this stroller! 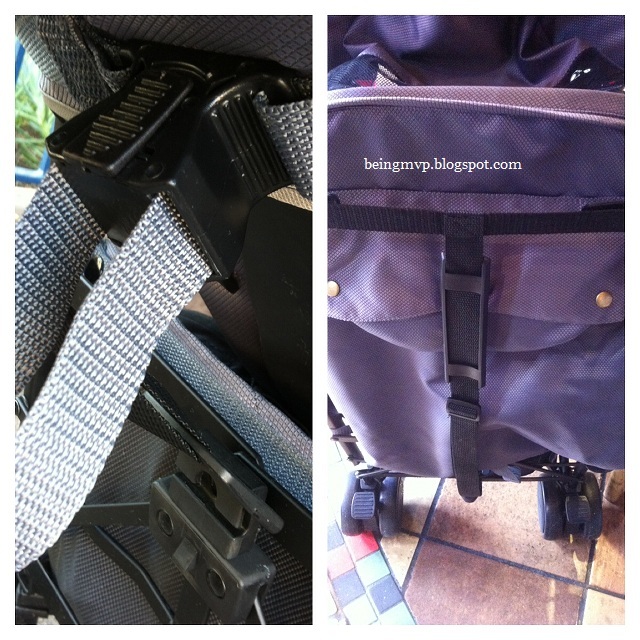 Baby Cargo has an awesome line of strollers. Very easy to maneuver. Thanks for sharing. this reminds me of the maclaren beautiful style! 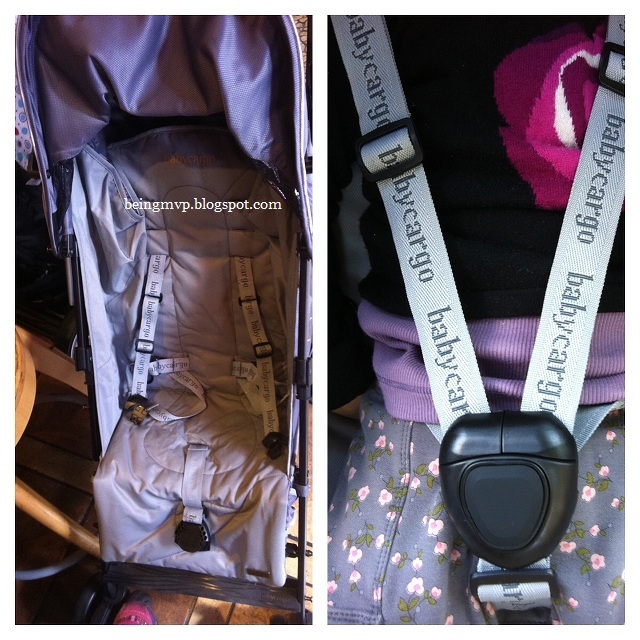 love baby cargo! Now THAT is a good quality stroller. Mine always fell apart! This looks like such a great quality light weight stroller! We need one of these because our other strollers are so bulky and heavy!